Pour water into large bowl. Add 1/2 cup lemonade drink mix; mix well. Add remaining cake ingredients; beat with electric mixer on low speed 30 seconds. Beat on medium speed 2 minutes, scraping bowl as necessary until mixture is smooth. Divide batter evenly among muffin cups, filling each about 2/3 full. Bake 20 to 25 minutes or until toothpick inserted in center comes out clean. Cool in pans 10 minutes. Remove from pans to cooling racks; cool completely, about 30 minutes. Meanwhile, in medium bowl, beat all frosting ingredients except food color with electric mixer on medium speed until creamy. If necessary, add a little more milk until mixture is spreadable. For a yellow frosting, beat in a few drops yellow food color. Refrigerate until ready to frost cupcakes. Frost cooled cupcakes. Refrigerator until ready to serve. Store in refrigerator. For streaks of yellow in the white frosting, add a few drops food color to the side of a decorating bag. Fill with frosting and pipe onto cupcakes. This will give you a white and yellow streaked frosting. 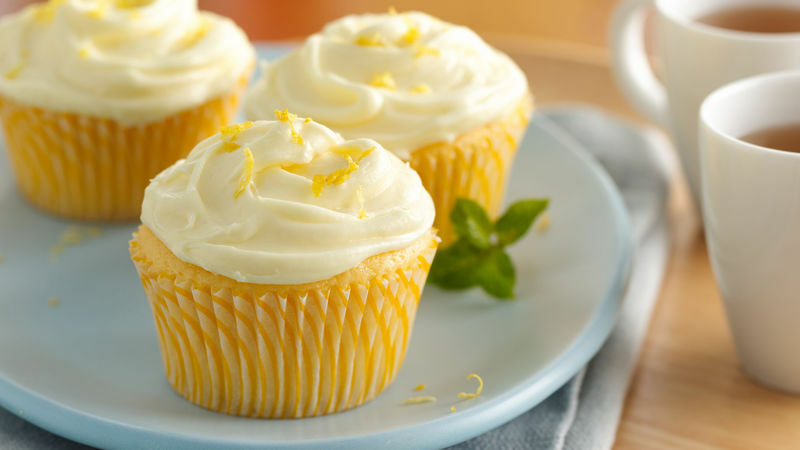 For extra lemon flavor, add a sprinkle of grated fresh lemon peel on the top of each cupcake. Fresh mint makes a nice garnish.